In 1969 the Senior Class decided that more women should be recognized for their service to the University. At the same time, they wished to honor the contributions of Gaylord P. Harnwell, a distinguished nuclear physicist who had served as President of the University since 1953 and had announced his retirement for the following year. The second women’s award is therefore given in honor of President Harnwell. First presented in 1977, this award is named in honor of a woman who served as Dean of the College for Women from 1958 to 1975 and who fought for women’s equality long before it was accepted. Rebecca Jean Brownlee earned three Penn degrees (B.S. in Educ., 1934; M.A., in Political Science, 1936; Ph.D. in Political Science, 1942), devoted more than 40 years of her career to Penn, and in 1986 received the University’s honorary Doctor of Laws in recognition of her extraordinary achievements. The Brownlee Award is symbolic of fourth honors among the senior women. Women’s Hey Day was the same day and time as the men’s until 1954, when it was changed to the evening before the men’s. This change resulted in a new ceremony. 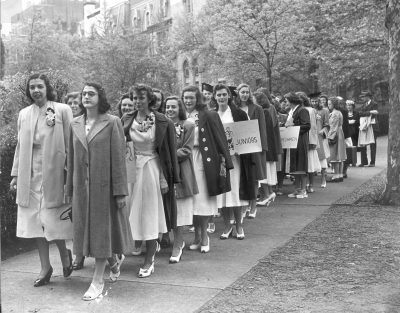 Immediately before Hey Day, a dinner was held for all women undergraduates at which the classes changed colors, a tradition at the time. The first joint men’s and women’s Hey Day ceremony was held in 1968. 1919 – Published report of “Girls’ Class Day” describes it as held in old Botany Hall on Hamilton Walk. It was apparently attended by women undergraduates only. The Program included a Class History, a Class Poet, and may have also included a class prophecy and mock awards. Dr. Minnick, Dean of the School of Education, gave the farewell address and a moving-up ceremony was observed, passing the Senior Class cap and gown to the president of the Junior Class. 1925 – Women, barred from participation in the Daily Pennsylvanian, initiate a women’s newspaper, The Bennett News. Description of Women’s Class Day includes mention that “as in former years” there will be “an award to that Senior who is chosen by her classmates as having, in her four years at Pennsylvania, done most to further the interests of women students at the University.” Winner(s) of this award not presently known, but the award was obviously very similar in nature to the men’s Spoon award. 1926 – Men’s undergraduate student government votes to exclude women from Hey Day celebrations; women undertake separate ceremonies. 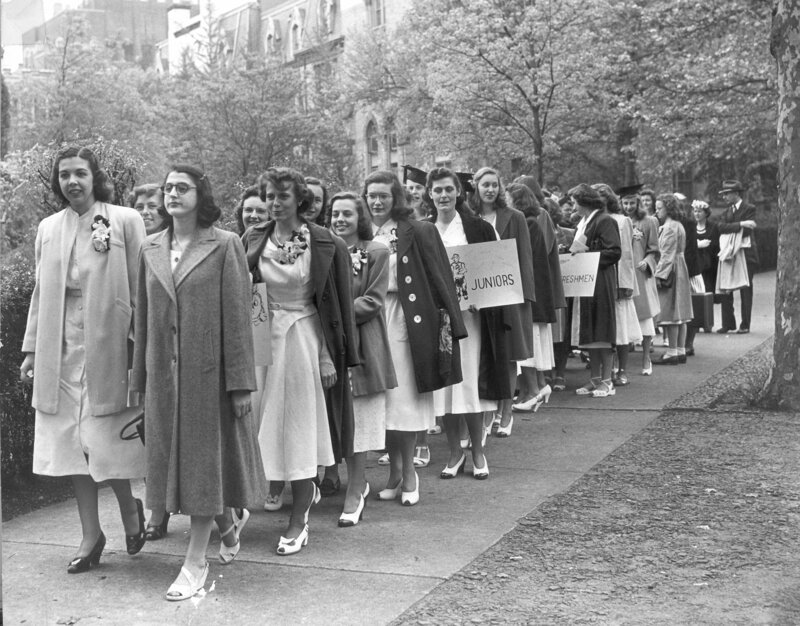 1954 – The Women’s Hey Day ceremony is moved to the evening before the men’s. 1968 – The Men’s and Women’s Hey Days are combined into a single ceremony for the first time.